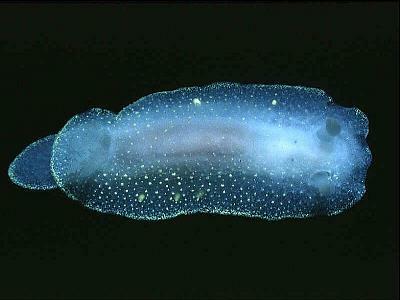 MOLLUSCA : NUDIBRANCHIA : Chromodorididae SNAILS, SLUGS, ETC. Description: This species is white or translucent white in colour, occasionally there is a yellow border around the edge of the mantle. The mantle tubercles are very short. One of the most characteristic features are the white or lemon-yellow glands situated towards the mantle margin. Mature specimens may reach 32mm in length. Habitat: Feeds on sponges such as Halisarca dujardini and perhaps Dysidea fragilis. 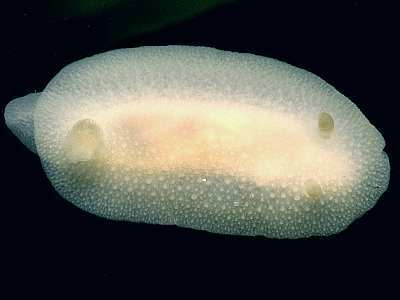 Cadlina is one of the few British nudibranchs which have direct development, with tiny juvenile slugs hatching from the eggs rather than veliger larvae. Distribution: Cadlina laevis has a wide ranging distribution, it is known from eastern America, Greenland, Iceland and from Norway to Spain. Flat oval body with small gills which retract into a pocket. Defensive lemon glands around the edge of the mantle. Picton, B.E. & Morrow, C.C. (2016). Cadlina laevis (Linnaeus, 1767). [In] Encyclopedia of Marine Life of Britain and Ireland.